Woad (Isatis tinctoria) was the Anglo-Saxon source of indigo blue. Although woad is not a true native plant (i.e. it was not present here before the formation of the English Channel), it is thought that it was introduced in the neolithic age when farming began. Some of the earliest textile fragments show evidence of having been dyed with woad and it was probably one of the first dyes to be used. As extracting blue from the indigo-bearing plants is somewhat more complicated than the method of extracting colour from most other plants, it may seem strange that blue was among the first dye colours. However, the indigo-bearing plants, including woad, were generally considered to have healing properties and it may be that their use as dyes developed from their use medicinally. For example, if woad leaves were applied to damaged skin as a poultice, perhaps together with urine, which was regarded as an antiseptic, the conditions necessary for extracting blue from the leaves might have developed. These conditions would be heat (from the skin) an alkaline medium (from the urine as it became stale) and bacteria from the urine. So one can imagine that, if the poultice was removed to reveal blue skin beneath it, people would have been able to work out how to use the leaves to dye textile fibres. Another possible scenario might occur if woollen fleece was being cleaned in a tub of urine and someone dropped woad leaves into the tub by mistake. The woad leaves might remain in the tub long enough for the urine to act on them and could, in effect, create a woad vat in the tub. When removed, the fleece would become blue on contact with the air. Once people noticed the presence of the woad leaves in the tub, they would probably have been able to work out why the fleece had become blue. All this is purely speculation, of course. Woad vats would have been organic in the Anglo-Saxon period and might have been made using stale urine, which provides both the source of alkali and the bacteria needed to make the vat active. Woad leaves may have been harvested and used fresh or they may have been allowed to ferment and processed into woad balls and stored for later use. Another method of dyeing with woad may have been the fermentation vat, made using wood-ash water as the source of alkali and madder and bran to induce fermentation and remove the oxygen from the vat. The recipes for these vats can be found in "Colours from Nature". 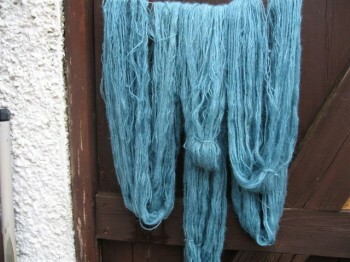 The first photo below shows pale blue shades from woad. 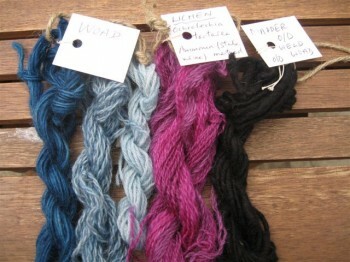 In the second photo the first three skeins show a range of shades from a woad fermentation vat. 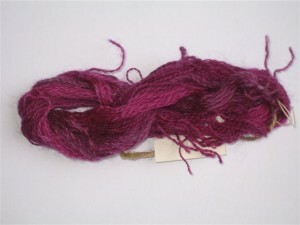 (The other skeins show lichen purple and black achieved by dyeing. Although walnut hulls are often the dye of choice for browns, I decided to use oak leaves and acorns in my tests, because the walnut tree is not native to Britain and walnuts may not have been widely available during the early Anglo-Saxon period. I harvested the acorns and oak leaves in early Autumn and dried the leaves before use. As oak leaves and acorns are rich in tannin, no mordant is needed. The first photo below shows colours from oak leaves. 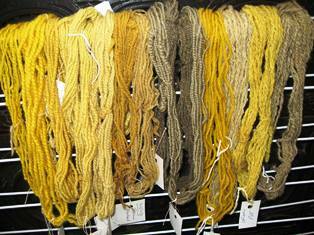 An alum or clubmoss mordant produced slightly more yellowish colours and a tannin mordant made the colours deeper. An alkaline modifier increased the depth of these colours. Mid-grey was achieved on unmordanted fibres modified in iron and a very dark grey was achieved on tannin-mordanted fibres modified in iron. The second photo below shows colours from acorns. The comments on mordants and modifiers, made above for oak leaves, also apply to acorns. 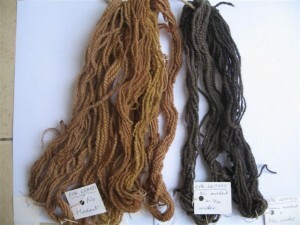 The dark grey was achieved on tannin-mordanted fibres modified in iron. Analysis of the dyes used in textiles from the early Anglo-Saxon period shows that purples from lichens were used in embroidery, narrow woven bands and accessories, such as bags and headdresses, rather than to dye larger fabrics. Bearing in mind the scarcity of purple-producing lichens in southern and eastern England, this is perhaps not surprising. This photo gives some indication of the beautiful purples available from lichens but does not do justice to the brilliance of these colours, which sadly are not very lightfast. I do not recommend using lichens for dyeing, except in very small test dyebaths, as lichens grow very slowly and may take a long time to regenerate. Lichens should never be harvested indiscriminately and some may be protected species and should never be gathered. It is very important to be sure you have correctly identified each lichen before even considering collecting any. However, even a small piece of lichen the size of a large coin can yield enough purple dye for most test purposes. Purple-producing lichens are prepared by soaking them in stale urine or in a solution of 2 parts water to 1 part ammonia. Use a strong glass jar with a well-fitting lid and shake or stir the solution every day. It can take several weeks for the purple colour to develop. When the solution is a rich purple in colour, strain off the liquid into a dye pot and add the fibres to be dyed, plus more water if necessary. If you have used ammonia, make sure not to inhale any of the rather unpleasant fumes. (Stale urine can be equally unpleasant, of course!) Then heat the solution gently to simmering point and simmer gently for about 30 minutes. Take great care when heating the solution, as ammonia can catch fire very easily. Then allow the fibres to steep in the solution overnight. Then remove the fibres, squeeze the excess liquid back into the pot and re-use the solution until it is exhausted. If the dyed fibres are steeped in an acidic modifier (for example in a solution of clear vinegar and water) they will become redder in tone. Using an alkaline modifier, such as wood-ash-water, will make the fibres more purple in tone. 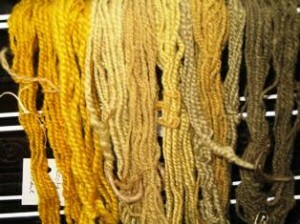 The 4th skein from the left in the photo below shows some of the variations from acid and alkaline modifiers. Weld (Reseda luteola) and dyer's broom (Genista tinctoria) were used by Anglo-Saxon dyers for yellows and remain in use today because of their reliability. Yellow tends to be the natural-dye colour that fades most rapidly but yellows from weld have better fastness properties than most other yellow dyes. Dyer's broom has similar dye pigments to weld and also has good fastness. 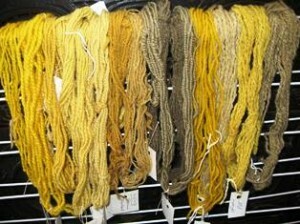 Using an alum mordant gives the brightest yellows and clubmoss mordant produces very similar shades. If these dyes are used without a mordant the colour is considerably less bright. 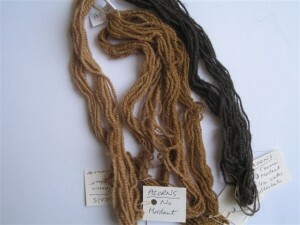 However, if an alkaline modifier is applied to these unmordanted dyed fibres, by soaking them in wood-ash-water, the colour becomes almost identical to the yellow achieved on an alum mordant. So, even if early dyers did not have access to mineral alum, they would still have been able to achieve bright, clear yellows from weld and dyer's broom. The use of tannin as a mordant makes the colours deeper than they would have been without a mordant but this yellow lacks brilliance. The use of an iron modifier after dyeing produces moss green shades on all fibres, although the green achieved on unmordanted fibres and those mordanted with tannin is duller.